Arsenal manager Unai Emery has said that he remains positive about the club's prospects of finishing in the top four despite losing to Everton on the road. The north London side had the chance to leapfrog Tottenham Hotspur to the third position in the league, but they failed to do so after succumbing to a slender 1-0 defeat to the Toffees. 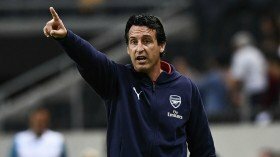 Speaking after the game, Emery admitted that the club missed the opportunity to gain a reasonable advantage in the top-four race, but they are still in a good position. The Spanish tactician added that the team need to show more consistency during the remaining six games of the season, he said: "I am in my mind in the same as before the match. "We know it is going to be difficult and today was a very good opportunity to take the three points and go third, but after the result we are fourth and we need to be consistent." Arsenal's immediate focus will shift to the Europa League where they are scheduled to host Napoli in the first leg of the quarter-final stage on Thursday night.